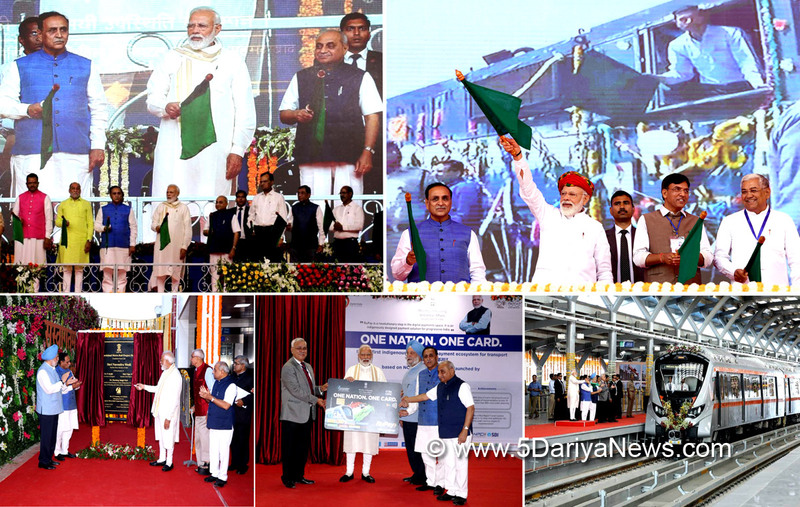 The Prime Minister, Narendra Modi, today,flagged off the Bandra- Jamnagar Humsafar Express, at Jamnagar in Gujarat. He dedicated the new 750 bed annexe of Guru GobindSingh Hospital to the nation and unveiled various SAUNI projects. He also launchedother development projects at Jamnagar including the 51 km pipeline from Aaji-3 to Khijadia.Addressing the huge gathering, the Prime Minister talked about the resolve and hard work of the Gujarat Government in the past couple of decades to deal with the water shortage problem. In this context, he mentioned about his determination to not allow ‘Tanker Raj’ in Gujarat and how Sardar Sarovar Dam has brought relief to the people of the Gujarat. He appealed to the citizens to conserve each and every drop of water for the benefit of present and future generation.Hailing the health sector revolution in Gujarat, Prime Minister said that the hospitals that have come up in the past few years in Gujarat will greatly benefit the poor. He said that Ayushman Bharat scheme rolled out by the Union Government will ensure affordable and quality healthcare for the poor. The Prime Minister said that structural and long terms measures are required to overcome the challenges faced by the country, instead of poorly thought out short term ones. In this context, he mentioned about the long term visionary schemes introduced by the Union Government. He saidthat PM –KISAN scheme is a long term and comprehensive plan for the welfare of the farmers.Talking about the Union Government’s efforts in boosting the MSME sector, Prime Minister said that the easy availability of credit and people-friendly GST will greatly benefit the youngsters. He said that the initiatives taken by the Government has ensured improved Ease of Business rankings.Praising the efforts of armed forces, PM said that the entire nation is proud of our soldiers. He said that the menace of terrorism has to be eliminated.